Skeleton is a simple, responsive (video) theme from Simple Themes. If you like this theme, we encourage you to try some of our other WordPress themes. Today, people visit your website from a variety of devices ranging from desktop computers, tablets, and smart phones. The average user spends only a few seconds before making a decision to stay on your site or not. 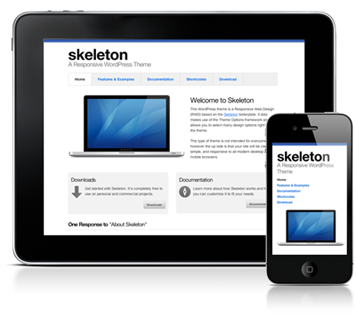 Skeleton is a WordPress theme aimed at helping you build simple, uncluttered, useable, and mobile-friendly WordPress sites. The tabs are clean and simple unordered-list markup and basic CSS.. The tabs work like a charm even on mobile devices. If there are too many they will stack (it’s not completely awesome, but still retains functionality). Get started with Skeleton. It’s completely free to use on personal and commercial projects. Learn more about how Skeleton works and how you can customize it to fit your development needs.